Yes, most flooring options look good after they are first installed. However, the true test of a floor’s worth are its looks and performance over years of use. When you compare flooring, you’ll be flooded with over the top sales pitches without much substance. The result? Many people find shopping for flooring a frustrating process and end up settling for something that may not be the best for them. To make things easier for you, this flooring comparison chart will show you the good, the bad, and the ugly of current flooring options and how they compare to Staybull Flooring®. Upgrade your space with Staybull Flooring® today. Staybull Flooring® is made of reclaimed strips of hardwood flooring that lumber mills squander. 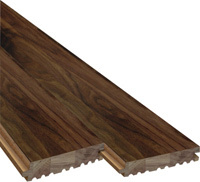 These strips are fused together to create recycled wide plank flooring. You get to use a high-end Eco-Flooring product that is structurally sound and an excellent choice for our environment. Advantages: The beauty and refinishing ability of solid hardwood flooring with the functionality, stability, and versatility of an engineered flooring product. Most Bamboo flooring is structurally weak. Use of formaldehyde and other toxic adhesives is also an issue. Many styles, colors, and textures. Manufacturing is not eco-friendly. Many maintenance issues. Uses less wood than standard hardwood floor planks. Thin wear layer means many brands cannot be refinished. Many species to choose from. Can be refinished. Cupping, twisting and limited install options. Eco-friendly, but with some major limitations. Color options are expensive. Hard to refinish due to thin structural integrity. The look of wood, without the durability. Many install options. Boards can move/shift underfoot.